With the highest unemployment levels in decades, many Americans are looking for ways to bring home extra cash. Well, just about everyone has heard that the price of gold has been at or near all-time record levels for much of the past two years (ignoring inflation). In addition, there are a number of so-called gold experts who are proclaiming that the price of gold has peaked and will fall from current levels (I am not one of these people). As a result, the number of people selling gold jewelry has soared. How much has activity grown for gold buyers? At my store in Michigan, we are required to file police reports when we purchase jewelry from the public and pay a fee to the city of Lansing. At the current rate at which we are filing police reports so far in 2010, our annual total will be almost seven times the number of reports we filed for the year 2007 and nearly 30 times the number of reports we filed in 2002! In a survey performed by some of my employees early last year, we found out that about 15% of the public is under the impression that everyone who advertises to buy gold pays the same price, so believe that it does not matter whom you deal with. In early April 2009, we commissioned people outside of my company to anonymously survey all of the companies in our market who advertised on television, in newspapers, or in the yellow pages to buy gold and jewelry. The jewelry pieces used in the survey had no stones and were clearly marked by a reputable manufacturer as to purity, so there would be no question as to what was offered for sale. Over a period of three days, each buyer was visited up to three times, with differing merchandise, by different people each time. We then converted the offers into percentages of gold or silver value to adjust for fluctuating spot prices. The results of the survey were a real eye-opener. My own company not only was the highest buyer of each of the items tested, but the closest that any competitor came to us was about 14% lower. The lowest offers—about 85% less than offered by my company—came from an out-of-town hotel buyer and one of the better known jewelry stores in our area! One jewelry store had widely varying offers, that ranged from 20-85% lower than my company offered. In the judgment of those who conducted the survey, they believed that the employees at the store with the widely divergent prices were instructed to size up the customers to gauge how cheaply they might be willing to sell their items, and then make an offer accordingly. Gold and silver jewelry is bought on the basis of the weight and purity. Precious metals are traded in troy ounces, which weigh roughly 31.1 grams. This is about 10% heavier than the avoirdupois ounces (28.35 grams) used to weigh bananas and humans. Pure gold is 24 karat (.999 fine or higher), so 18 karat has a purity of 18/24 or 75% by weight, 14 karat is 14/24 or 58.33%, and 10 karat is 10/24 or 41.67% purity. Sterling silver is 92.5% purity. To try to figure the value of gold jewelry you have (excluding any stones or the weight of any non-gold sections), get a gross weight of the item. Say you have a 14 karat ring that weighs 5 grams and that the spot price of gold is $1,250. The calculation is 5.0/31.1 = .16077 troy oz times .5833 = .093778 oz of gold times $1,250 = $117.22 gold value (also called its intrinsic or melt value). The September 2009 issue of Consumer Reports included a discussion of companies that buy jewelry from the public and recommended only selling if it was possible to get offers for at least 50% of the metal value. In the above example of the five gram gold ring, that would indicate that a fair offer would be one that comes to a minimum of $58.61. In the April 2009 survey, our company only found three out of fourteen local buyers who consistently offered at least 50% of gold value for jewelry. None of the mail-it-in companies who were contacted over the phone or who quoted their buy prices online offered close to 50% of gold value as they ranged from only 11% to just 27% of gold value. At a national coin show a few months ago, we queried dealers across the country about the formulas they paid customers for gold jewelry. Most of the answers ranged from 60-65% of gold value. The highest any dealer would offer was 70% of gold value, but only for special customers or very large quantities. Recently, Sears and Kmart announced that they are working with a mail-it-in company where the mailing envelopes can be picked up at any Sears or Kmart store. The merchandise is not priced until after the goods are delivered to the company, so there is a risk of a price decline. However, unlike many mail-it-in companies, this buyer posts its current buy prices on its website. When I last checked them, they were offering roughly 61-62% of gold value. The prices offered by the buyer for Sears and Kmart tend to be 12-15% below what my company pays the public, but it is a good reference point for comparing the offers from local buyers in your area. When trying to sell your gold, we have seen a wide variety of tricks and scams used by some gold buyers, trying to take advantage of the relative lack of knowledge of sellers. From all of the horror stories we have heard over the decades, here are some tips on how to protect yourself from them and to help you get the highest price for your gold and silver jewelry. Obtain at least two buy offers. Sometimes when driving down the street of a commercial district, it seems like there is at least one window sign every block proclaiming “We Buy Gold.” If you comparison shop, you will at least avoid the lowest buyer. At each shop, ask the buyer the weights and purities and price per gram that they are figuring. If you have only a few items, they should be willing to do each piece separately. If you have a larger quantity, it is possible that they may weigh up all the 14 karat pieces for one lot total, the 10 karat as another lot, and so forth. Get more than two offers if practical, especially if the first two you obtain are quite different. When you get the information on weight and purity, use that information to calculate what percentage of gold value you are being offered. Before setting out, you may want to check a free website such as www.thebulliondesk.com to get a fresh spot price so you can later enter the weight and calculate metal value. Don’t always believe quotes that you hear on the phone. Several potential sellers try to save time and gas money by calling around to check on what buyers will pay per gram. Many buyers are cagey and will refuse to quote over the phone, often because their buy prices are not competitive. Some will tell the caller to get their best price elsewhere, and then bring the items to them for a better offer. Several of our customers have told us that they were quoted one price over the phone, but then when they went to the buyer’s store, the competitor tried some of the tactics described below—effectively offering a lower price than quoted over the phone. We have instances of some buyers in our area who, while the customer was standing in front of them, have called our store to check on our current buy price, telling the customer that they would match our price, but then telling the customer a lower rate than we just quoted over the phone. Watch out for offers to buy jewelry at a lower purity than marked. There are a number of counterfeit markings on jewelry, where the actual purity is lower than marked on the pieces. We have seen hundreds of pieces of jewelry marked either 10k or 14k that tested as being only 6k to 8k purity. There are also gold-plated and gold-filled jewelry items that are passed off in the market as solid gold, sometimes with the counterfeit purity markings. So, just because a buyer says that he might be offering on an item as being of lower purity than it is marked does not automatically make him or her deceptive. However, comparison shopping should help protect you from this practice. If every buyer downgrades the same items, they are probably correct. 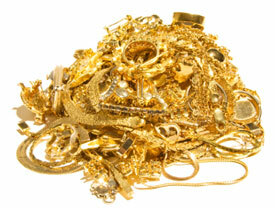 Be wary of buyers claiming to buy for jewelry value rather than for metal content. One recent example should suffice. A woman showed us a set of jewelry she had inherited. We offered her well over $500 for it for the gold value, but she was upset that we did not offer to buy it as jewelry for resale as is. She called around and found a buyer who claimed he would pay extra for the jewelry value, but only offered her $175 for the set. What counts is the actual amount they offer to pay, not the pretext on which buyers claim to calculate their offers. Try to get a quote from a coin or bullion dealer. Long time, well established coin and bullion dealers are used to working on much smaller profit margins than jewelers and antique dealers. From what customers have told us, coin dealers frequently offer the highest prices compared to buyers in other industries. That does not apply to every coin dealer, but you don’t know until you check them out. Do not let your items out of your sight! Customers have made allegations to us about at least one jewelry store in our area where the buyer’s practice is to take jewelry out of the customer’s sight because “I have the tools at my bench.” This buyer has even removed stones (without first asking the customer’s permission!) to get an accurate weight of only the gold, with some customers telling us they are sure that diamonds were switched for less valuable ones while the jewelry was out of view. Technology has made digital scales inexpensive and very portable, with many models that will fit in shirt pockets. If a buyer wants to go to a different desk to examine your items, they should be willing to let you accompany him or her. If not, you might be better off just walking away and skip getting their offer. Be on the lookout for rigged scales. If you visit two or more buyers, you should be safe from a buyer that has a scale rigged to under weigh your items. Here is any easy check against that—US nickels weigh 5.0 grams, even those with some circulation. Take a nickel with you and ask the buyer to weigh it. If it reads 4.9 grams, that might be close enough. If it weighs 4.8 grams or less, don’t bother with that buyer. Watch out for prices quoted in pennyweights. There are 20 pennyweights in a troy ounce. That means that each pennyweight is equal to 1.55 grams. To make their buy prices sound higher to unknowledgeable sellers, some buyers quote prices in pennyweights. Where we have seen that practiced in our area, pennyweight buyers pay less than we do. For instance, if one buyer is paying $12 per gram for 10 karat jewelry, that means that another buyer using pennyweights would have to offer $18.60 per pennyweight to match the offer. But, just about always, the buyers who quote prices in pennyweights might only offer $14-15 per pennyweight in this particular example. The dollar amount is higher than the gram price, but the total price will be a lot less than offered by the buyer quoting in grams. Pay attention to any deduction for the weight of any stones. Precious and non-precious stones weigh something. A few buyers use a very low buy price, but claim they are offering a higher price because they are not deducting any weight for the stones. Some buyers, through lack of experience or deception, routinely subtract too much for the weight of stones. This is why it is more important to compare the actual offer on an item rather than the alleged rate per gram or pennyweight. Some buyers, such as my company, are frequently able to remove and return stones, often at no charge. Unfortunately, very small diamonds have so little value that they cost more to extract then they are worth on the wholesale market. Don’t expect buyers to pay extra for them unless they are already paying so little for the gold that they can appear to do so. Question coupons or programs to temporarily pay an extra high price or bonus. With one exception, our experience with this gimmick is that such buyers still offer sellers a lower price, even after adding the “bonus,” than my company’s regular buy price. Strong buyers don’t have to resort to such gimmicks. Do check with established local buyers. It might seem obvious, but a lot of people have been underpaid by selling to buyers who are here today and gone tomorrow. Without meaning to necessarily knock every such buyer, the overwhelming stories we hear about 1) hotel buyers, 2) people with temporary spaces at flea markets and antique malls, and even 3) people who make a career of going around to garage sales trying to get people to part with their jewelry on the spot, all pay lower to much lower prices than are offered by companies that are well established in the local community. Think about it. A company that has been around for a few decades has a reputation to protect and depends on repeat business for their success. Temporary buyers do not have the same incentive. Once again, comparison shopping is the key. Resist high pressure tactics to sell immediately. Buyers who offer lower prices have an incentive to get sellers to part with their merchandise before they have the opportunity to compare prices with competitors. Any buyer who starts to offer a higher price as you walk out the door obviously is not a serious buyer. Also, any buyer who says their offer only lasts as long as you are on their premises is just using on a high pressure tactic. True, gold prices may fluctuate slightly if you come back later (and may actually be higher! ), but there are lots of potential buyers in the world, many of whom will almost certainly offer the seller a higher price. You don’t have to sell today or even at all! Be careful about jewelers offering extra high trade in values toward the purchase of new merchandise. In our price survey, we found one jewelry store that offered about 25% of gold value to buy jewelry for cash, but would offer double that amount as a trade-in against the purchase of jewelry selling for at least double the price of the trade-in. Even the trade-in value was well below what my company’s cash buy price was, so that the seller would have been better off selling the jewelry to us (which is what happened) then going back to the jeweler and paying full price for the new jewelry. Some jewelers may offer a very good trade-in credit on merchandise you really want to purchase, but you still should check elsewhere to verify what you could be paid in cash. Check that buyers are properly licensed and complying with state and local laws and ordinances. Michigan, like many states, requires that buyers of jewelry and gems obtain a separate license from the local police department or sheriff’s office in order to legally buy such items from the public. The Michigan statutes also require that licensed buyers “conspicuously display” this license and submit police reports for each jewelry and gem purchase from the public. Failure to register with the police or submit the police reports are felonies in Michigan. A buyer who cuts corners by not complying with such laws is far more likely to try to take advantage of unknowledgeable sellers. Some buyers try to claim that their sales tax license, jewelry store license, pawnbroker license, and the like are sufficient licensing for this purpose. In Michigan, they do not constitute compliance with the state law about regulating the businesses of buying jewelry and precious gems from the public. You may need to investigate the particulars that apply for your state. This does not exhaust the list of gimmicks and outright scams, but it hopefully arms you to avoid selling to the lower buyers. The most important protection is to compare prices from at least two or three buyers. To try to make it easier for readers, here is a summary of how to calculate 50% (the minimum recommended in the Consumer Reports article) or the 61% (offered by the mail-it-in buyer working with Sears and Kmart) of gold or silver value, no matter which kind of weight a buyer is using. Remember, you can get a current spot price on the internet by going to www.thebulliondesk.com. You may want to take these tables with you when you do your price checking. Good luck. Great article – very comprehensive. The margins in the UK seem to be a lot tighter than you have. This has lead to some dealers trying to hide their fees in the small print of their Terms & Conditions. – even fees to send a payment to a customer! Thanks for the informative article. I read that the buyer behind the program at sears/kmart is actually the chinese government which is trying to build up its gold reserves. Can anybody confirm? The best information I have is that one of the owners of the company purchasing jewelry in association with Sears and Kmart is a company based in Taiwan. It is Chinese, but not from the People’s Republic of China. Thank you so much for the in depth information. Here is one piece of advice that is very important if you decide to use a gold mailing service. ALWAYS take pictures of each piece of your gold jewelry individually before you send it to the gold buyer in the mail. Many of the mailing service gold buyers are reputable, but you should always have a back up plan if you suspect something is wrong. Really good and in-depth info here. Thanks. But this should be in local newspapers… you’re kinda preaching to the choir here. Very good info for the public. Although I would disagree on the gram to pennyweight position. One troy ounce is broken down to equal 20 dwt (pennyweights) a even round number that the jewelry industry manufacturers, suppliers and refiners deal with. A troy ounce in grams equals 31.10348, not a round number. And is really only used by retailers when buying gold. It has always been my understanding that this was because it makes the weight sound larger. 1 gram=.643 dwt. If the company is honest it shouldnt really matter. Kinda like whats heavier 1 ton of feathers or 1 ton of bricks. I work for a refiner that has just recently started dealing directly with the public. Metallixdirectgold.com. Check us out. That is a good point that what counts is not the calculations, but the amount that they offer to pay. If my wife were to sell her gold jewelry, then we would want to get the best value on it that we could for the gold price. That way we could get a good amount of earnings off of it that is deserved.